Saturday June 10th 1899 Rob brought his Mother down early this morning and he took the mules and waggon back with a load of feed. We put in a very busy day sewing and got a great deal done. Hattie took Miss Murphy home. Newell went home and Luther to town so Will and I spent the evening on the porch alone. fine day. 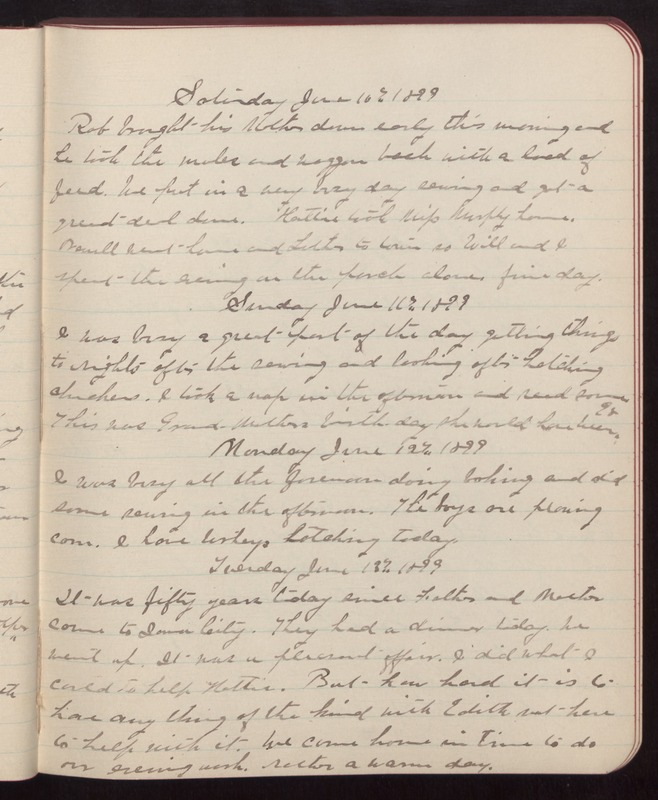 Sunday June 11th 1899 I was busy a great part of the day getting things to rights after the sewing and looking after hatching chickens. I took a nap in the afternoon and read some This was Grand-Mothers birth-day she would have been 98 Monday June 12th 1899 I was busy all the forenoon doing baking and did some sewing in the afternoon. The boys are plowing corn. I have turkeys hatching today. Tuesday June 13th 1899 It was fifty years today since Father and Mother came to Iowa City. They had a dinner today. We went up. It was a pleasant affair. I did what I could to help Hattie. But how hard it is to have any thing of the kind with Edith not here to help with it. We came home in time to do our evening work. rather a warm day.